Our hygienists will help you keep your teeth healthy and strong. Rancho San Diego Dental is your home for leading-edge dentistry. We have nine dental lasers, which is more lasers than any other dental practice in San Diego County. In fact, we have every single laser used in dentistry today. Our state-of-the-art lasers allow us to offer more efficient and comfortable deep cleaning. Laser procedures usually require no anesthetic, tend to involve less bleeding, lower risk of infection and enable patients to heal sooner than with conventional methods. Often, patients who thought their only option was painful gum surgery have been amazed by laser-assisted surgical gum care. Gum disease is the #1 cause of adult tooth loss in the United States. 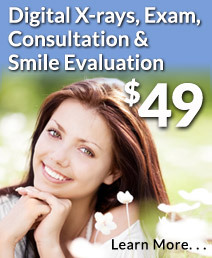 So arguably the most important visits you may ever make to the dentist are routine dental cleanings. Teeth cleaning is the first step in the prevention of gum disease and the foundation for good oral health. Our well-trained, experienced hygienists use advanced lasers that gently remove stains and heavy tartar. Our hygienists believe in educating the patients to help them better preserve their teeth. Each of our hygienists takes the time to teach patients with questions how to brush and floss correctly. They’ll show you pictures of your own mouth taken with our intraoral camera so you can see the target areas for cleaning. Our hygienists are gentle in their cleaning, although thorough. One of their tools is the ultrasonic scaler. They use it on a case-by-case basis for heavy stain, heavy calcium deposits, for when the patient has inflamed gums and for orthodontic patients. Scaling and root planing is the first treatment for mild to moderate gum disease (Gingivitis). It is also known as Deep Cleaning. Scaling is the removal of tartar from your teeth. The procedure is performed by the hygienist using an ultrasonic scaler that gently strips deposits from your teeth and roots through the use of ultrasonic waves. We use a soft tissue laser to painlessly remove infected tissue. The laser doubles as a disinfectant since the heat kills all bacteria on your gums. It also seals your nerve endings and promotes healthy gum regeneration. Our hygienist then carefully planes the root surfaces to avoid future tartar buildup. Smooth root surfaces permit your gums to regenerate without irritation. The gum tissue shrinks and tightens around the teeth, since the irritant has either been eliminated or reduced. ARESTIN® is an antibiotic that helps kill the bacteria at the root of your problem. ARESTIN contains microspheres, which are tiny, bead-like particles that aren’t visible to the naked eye. These microspheres are filled with the antibiotic minocycline hydrochloride. We use ARESTIN therapy for more aggressive gum disease. The microspheres are placed in the infected gum and release the antibiotic over time, killing bacteria on an ongoing basis so your gums can heal. Dr. Joel Henriod utilizes dental lasers in handling severe cases of gum disease. Severe gum disease, or Periodontitis, is treated by our resident Periodontist and partner in the practice, Dr. Joel Henriod. Dr. Henriod is a Board Certified Periodontist and a well-known lecturer and teacher on periodontics and oral implantology. He focuses on minimally invasive treatment and has helped many patients overcome even the most aggressive gum disease without the use of surgery. Read more about Periodontic Treatment. "The feeling of the office when I first walked in was one that made me feel comfortable and at ease and very welcome.